Here in Kentucky, homeowners are concerned these days about high winds, and even freezing temperatures, pushed into the region by tropical storms and mounting winter blasts. We’ve addressed the extreme winds that can occur, even here, earlier this month. Now, let’s take a look at Ice Dams. Air Leaks. Warm air from a home’s living space leaks into the attic and if not properly vented out, warms the roof deck from the underside, causing snow to melt. But then the melted water re-freezes over the home’s overhangs, resulting in a growing and progressive ice dam. Roof Geometry. The shape and directionality of the roof simply result in areas where snow melts on the roof due to heat from the sun but then runs into “log jams” of converging snow loads on the roof and can’t escape, eventually re-freezing after the sun goes down. So, what can you do to prevent ice dams? First of all, it is critical to ensure that air or heat leaks from your home’s living space into the attic are sealed. These leaks can result from poor insulation or from things like ceiling light fixtures that are not properly sealed. Look also at attic access hatches, skylight chases, and alongside chimneys. After air leaks have been eliminated, having good attic ventilation is critical to vent out any heat that does make its way into the attic. It may surprise you, but the goal is to keep your attic temperature as close as possible to outside temperatures during both the summer and the winter. Proper ventilation requires an equal balance of intake vents (usually at the bottom of the roof) and exhaust vents near the ridge of the peak of the roof. If air leaks and ventilation have been addressed and problems with ice dams persist, then it usually comes down to the shape of your roof and “log jams” of sliding snow and ice as described above in the second point about shape and directionality of your roof. 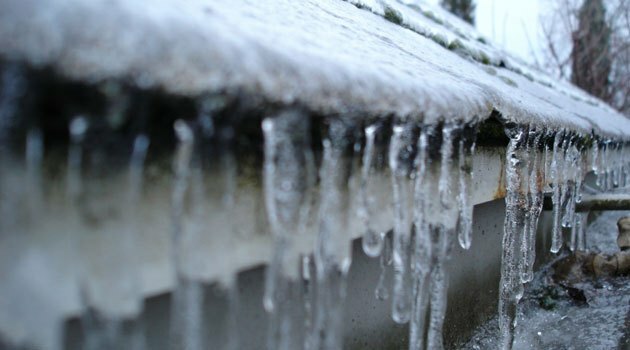 For these situations, it is usually necessary to use heat to melt the ice on the roof and alleviate the ponding of damaging water behind the ice dams. One thing to keep in mind is that interior damages result from ponded water that makes its way into the home. The ice itself is not so much the problem. Therefore, if you can provide an “escape route” for the melted snow to exit the roof, the ice dam does not continue to grow from melted water that re-freezes and the water does not make its way into the home. While many of the heating systems designed to melt snow and ice available today concentrate on the eave edge of the roof, they often do not heat far enough up on the roof to effectively relieve any ponded water. A product like Ice Dam Cutter, with heated bars that extend vertically up the roof, can work magic on troublesome ice areas by allowing melted water to escape the roof. Ice Dam Cutter needs to be combined with heat cable in the home’s gutters and downspouts so that the melted water can get away from the rooftop. If you continue to struggle with ice dams, contact us. We’d be happy to talk through your situation and lend our advice. And, while metal roofing is not a “cure all” for ice dams, it can play a role in alleviating troublesome situations.